Villa MAS FRI: 6br, 6ba, Pool. Just completed in early 2008, so everything is lovely and new. All equal bedrooms and nice views. Villa MAS BOR: 2br, 3ba, Pool. Fantastic views and great breezes. Perfect for two couples or a small family. Villa MAS GRE: 4br, 4.5ba, Pool. Overlooks one of the most delightful villages on the island, great for a group with children. Nice, cool breezes. Villa MAS CAR: 5br, 6.5ba, Pool. We had a picnic lunch here and absolutely loved the entire house and overlook of Peter Bay. Villa MAS PRE: 6br, 6ba, Pool.Extremely ornate with a concierge on staff. Every detail has been thought of, even a washer/dryer in the master suite. Dinner was at Caneel Bay at the Equator Restaurant, an 18th century sugar mill. I had very nice lamb chops and we watched some storms off towards St. Thomas. We stole a little Internet time at Caneel Bay before heading back to Villa CT LAT for the night. Villa CT CHA: 2br, 3ba, Pool. Absolutely loved this house. Great views, beautiful woodwork. Perfect for 2 couples. Villa CT ISL: 4br, 5ba, Pool. 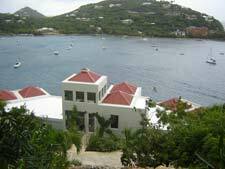 Outstanding views of Tortola and St. Croix! Great outdoor living areas and heated pool. Villa CT EST: 4br, 4.5ba, Pool. Fantastic views and proximity to Coral Bay. Very quiet and great for 4 couples wanting to be away from it all. Villa CT FRA: 5br, 5.5ba, Pool. Amazing style, equal sized rooms and great common areas and views of Francis Bay (only a 10 minute walk-max away). Villa CT ESP: 3br, 3.5ba, Pool. A great gingerbread style house with a nice pool and views. Lunch was at Island Blues and when we were done eating, we strolled Mongoose Junction for some last minute presents, went back to Hawksnest for our last St. John beach fix and then the hunt for pizza began. Being the season it is, Ronnie's, the pizza place, was not open- so we ended up at Waterfront Bistro and watched another storm approach from St. Thomas. 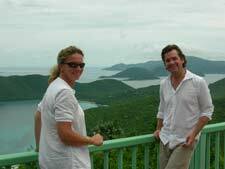 St. John is a truly magnificent island. It is quiet, relaxing and utterly gorgeous. While there are plenty of great restaurants for food enthusiasts and shopping for everyone, St. John’s unspoiled landscape is ideal for beach lovers, sailors, hikers and anyone who loves the outdoors. 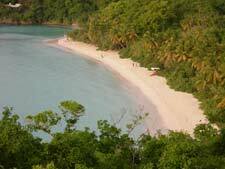 This island is the Caribbean at its very best!